Improper Course: Kingston, Here We Come! I was asked about my preparation for the next Master Worlds in Kingston, so here are the four things I'll be doing. Lasers are sailed in three different conditions: light winds (up to 5 knots), medium winds (for me, 5 to 15 knots), and strong winds (for me, over 15). I do not know of a single Laser sailor who has world-class speed in all three, so we have to specialize. If you're light, then you need to be fast in medium conditions and you need to work on being in great shape. If you're heavy, you need to work on your medium conditions and you had better be in shape to do well in a breeze. I'm light and my medium speed is good, but I'll brush up by (1) practicing at night. I have found that this is the best way to get a "feel" of what is fast in a Laser. 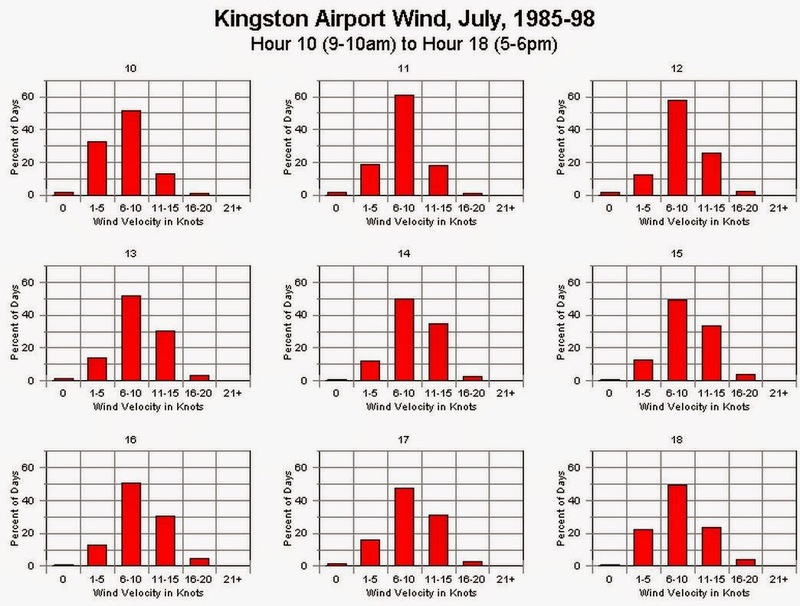 Kingston will probably not have many windy days, but some bad finishes like I had at the last Worlds at Hyères will kill any chances of doing well. So, I'm focusing on my (2) cardio on an elliptical machine and (3) strength on a hiking bench. noon to 1600 hours it holds above 6 knots over 85% of the days." Translation: we can expect medium conditions. This will be my final event as a Grand Master, so I'll be sailing a full rig. For the final preparations, I'll be (4) training on Italy's Lake Como with Roberto Bini (ITA), then competing with him at the Euro Masters, and then training with Mark Bethwaite (AUS) and others in Kingston before the Worlds start. It should be an awesome event! Good luck Doug. Go out (of grandmastership) with a bang! Thanks. It will be tough as the US will have a very strong team. I suspect 3-4 will make the top 5. Thanks Bob, you are correct. The chart I posted was for wind direction, which is really not that important. I've changed the chart to show wind speed which is much more relevant. If we get "average" conditions, it will be under 10 for 4-5 days and 10-15 for 1-2 days. But I'm reminded of the many talks I've had at a worlds event with the local fishermen... they almost always say, "it's never like this.,"
Not sure if you've ever sailed in Kingston before, but it's known for its thermal winds and sea breeze during the summer. Wind often fills in between 12 and 2, and is often over 15 knots in the summer and the fall in the afternoons. Thermals will typically come in from the west-southwest, and will generally knock left as the day goes on. I'd be prepared for some breeze. However, we do get several days of light air in the summer as well, and it occasionally comes from the north, or east, if its coming from a weather system. This means smaller waves. Soure: I'm a Canadian sailor who has competed at CORK for several years, and race for Queen's U (in Kingston) in the late summer and fall on the college circuit. Thanks for you comments, they are very helpful. I sailed at CORK a few times when I was growing up in Montreal, but my recollection is not as specific as yours. And of course, the locals at a worlds event often just say "it's never like this."